'De Volkskrant' is a Dutch national newspaper. And recordlabel apparently because they released this 5 (five!) CD box. And, since this can be had for just 25 euro, I started to think the people from De Volkskrant had taken "freedom of press" a bit too literally. Not so, the actual record label responsible for this is SDEG, Swamp Dogg's very own Entertainment Group. 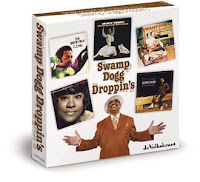 According to the introduction in the booklet, the selection of albums was made by Jerry Williams (Swamp Dogg) as being his best productions and collected for De Volkskrant specifically. The rest of the booklet, in Dutch, contains a little info on each album and some quotes by Williams. I'm sure Swamp doesn't mind re-selling 30+ year old records and if that has to happen in a "special" package, so be it. It's also a nice thing for a newspaper to offer to its readers. That would make it likely these kind of sets are available in other countries too but I don't know of any. De Volkskrant has a webshop but it's in Dutch and I don't know if they do overseas shipping. This set is made by Catch A Fire, an "entertainment marketing" company, perhaps they're busy marketing this entertainment somewhere else too. If you know something more or have advice how to obtain this set from outside The Netherlands, feel free to drop a comment. - Doris Duke - I'm A Loser: I've had this album on my blog before, in the 2005 Ace/Kent release. A superior release, it features 2 Duke albums, 3 bonus tracks and excellent booklet. Featured here is the 12 track rip from Droppin's. - Z. Z. Hill - The Brand New Z. Z. Hill: Hill had a record deal with somebody he refused to record for, the contract was sold to a third party who sold it to Swamp Dogg. Hill was not amused (even less than he already was) but got interested when he heard the plan: Swamp Dogg's wife had an idea for a "bluesopera". The mp3's total a little over 100 MB so I broke them in two: the first part are the 10 tracks of the "opera" album, the second part contains bonus tracks and alternative ("collector's") versions. 1. Don't bother with Doris Duke since you already have that one in your collection (if not, get the Kent CD from your local shop and rip it yourself. Or get the MP3's here and then find it's worth going to your local dealer for the CD). 2. Get at least Total Destruction To Your Mind and Z. Z. Hill part 1. 3. Then download the rest, including Hill part 2 because that's worth it too. All zip files combined are 316 MB for download and 318 MB extracted.